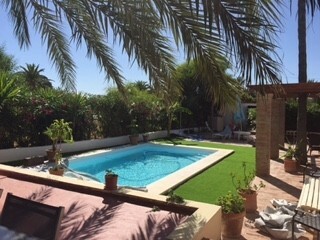 Renovated villa, with 3 bedrooms and 2 bathrooms, set at 200mts from the beach, all on one level, with pool and private garden. It has 2 independent living rooms with a fireplace in each, and a separate dining area, the kitchen is independent well fitted with direct access to the exterior. Building qualities are high g, double glazing and mosquito screens in every window. Each bedroom has independent air conditioning, fitted wardrobe in noble woods. Outside stairs up to the roof terrace of approx. 40m2 and some sea views. Excellent location, in Marbesa, not far from Marbella town.